Last Tuesday 17th September was the third Wirral Multi-terrain Race, the Harrison Drive Beach run near Wallasey. With less wind than previous years and the sand behaving itself it was a good night for running. Numbers are still down on Helsby participants for this event compared to previous years but we still had five green vests out making the most of the last midweek races before winter. Many thanks to Mario for sorting the numbers at the finish and to Joe and Mario for the big shouts throughout the race, which always helpful, especially on that tough beach run-in at the end. Please note the final race of the season is this Tuesday night 24th September. It’s a 6.30pm start at Arrowe Park, the venue for our Northwest Cross Country (park at the Cherry Orchard pub car park). Free Buffet and prizes follow. Just £1 to enter and no registration required, just the Helsby vest to be worn. Saturday morning saw the 29th Delamere Park Run 5k with first in for Helsby and 2nd overall Colin Bishop in 17.55 and first Helsby lady Louise McEveley in 57th in 24.00 for a new PB. Well done also to Kevin Smallwood for his for his PB. Saturday morning also saw our tenth fell counter of the season, the King John’s Castle Hill Race and with all still to play for in the Men’s Championship. It’s a shame Chris Baynham-Hughes couldn’t make it but respect should be given to Chris for helping out a friend instead in Snowdonia which is a very unselfish act. There are still two fell counters remaining so all still to play for. Jim O’Hara and Adair had a tough and close battle all the way round with the lead changing during the race to make it interesting on the day. Jayne Joy had a superb run for 1st lady overall. Adair was 2nd and Jim O’ Hara 3rd overall. Steve Riley and Paul Foster also had good runs. The course was reversed from previous years and a hill has been added so it’s now a really good race to try. I hope the numbers are up next year because it deserves a good turnout. Many thanks to Joe and to Mario for marshalling and for support. Full results on www.wfra.org.uk . Sunday was the Aintree 10k which saw Roy Gaskill 16th overall and a brilliant 2nd in his category. Roy came in feeling strong in 41.41. Also running was Tom De Jong. It was the Natterjack Seaside 10k in Southport yesterday, with two Helsby runners out making the most of the nice weather and both under the 40 minutes. It was a new PB for Colin by nearly a minute and only another minute off the winner so a fabulous run by Colin, be sure to congratulate him. Last week we also had two runners in the Great North Run. Mo hasn’t decided to join Helsby (yet) but Donna Geer chose this as her first half marathon and secured a time of 2.12.50. Well done to Donna and now her training can begin in earnest for the four villages. 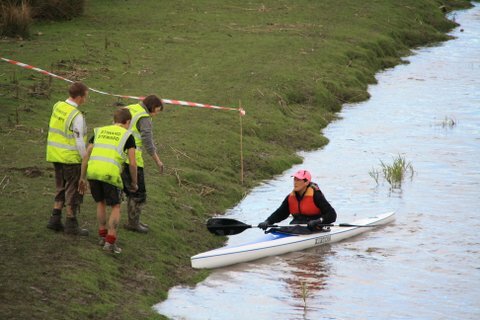 Also out on course was Helen Tudor battling through the crowds to secure a time of 2hrs and 24secons. I have been approached by Stuart Holliday, a PHd psychology researcher at the University of Central Lancaster, who is carrying out a long-term research project on mental health and well being for both runners and non-runners. Attached are some details about the project, which looks very interesting, particularly for members who may have experienced any issues surrounding their own weight management/running performance etc. The link below takes you to an anonymous survey which takes 10-15 minutes to complete, will help the project and will also increase awareness and understanding about this issue. Having bordered on an eating disorder myself when running a very high running mileage in the 1990’s (5’ 7”, male, 8 ½ stone – it’s neither good for health nor a good look!! ), I am sure there are many amongst us who can understand the problem but even if you’re not or have never been affected, your input will still be of equal value. The Peris Horseshoe – Taking on the best of the best! Those looking for a stern challenge can take on the half Peris which starts in Llanberris and after a short flat race to the quarry entrance it is up, up, up to Elidir Fawr, a short descent and fantastic run-able track around to the short climb to Y Garn, then another relatively short descent takes you to the base of Glyder Fawr. Summit there and the red spot path is all that stands between you and the finish at Pen-y-Pass. Those looking for a challenge at the extreme end of the fell racing scale can attempt the full horseshoe; it is truly epic, but it is certainly not something to take lightly. In many respects the course is insanity, but it is also simply stunning and on the right day provides more visual treats per mile than any other race I know of. Baring a few relatively minor mishaps, the race went well, to plan and I finished absolutely knackered and elated. 4 Hours, 20 minutes and 2 seconds officially (oh those two seconds). My target estimate had been sub 5 hours so a very good day out for me. It was a huge shame that Adair had to pull out of the full and Jayne from the Half Peris; but a wise decision made as you can’t stand the start line of this race with any doubts. My only regret on the day is not getting to see the elite boys in full flight (the race was won by Rob Jebb in 3:12:29!!!) but to do that I would not have been able to race so on balance there are no regrets! Tuesday 10th September was the second Wirral MT of the four race series held in Thurstaston, Wirral Country Park. There were eight out for Helsby in total with some great support from Joe and Mario. This puts Helsby’s mens team 19th on the night and Helsby ladies ‘A’ team 18th and ‘B’ team 33rd. Please see Steve Saunders website for full results of this race or to look for details on tonight’s Beach race, which is at the earlier time of 6.30pm at North Wirral Coastal Park, Harrison Drive, Wallasey. Please remember these races are only £1 and no registration is required, just turn up on the night in the green vest. Saturday 14th was the 28th Delamere Park Run 5k which looked like a close finish for the top three! Saturday was also the British Champs race (and North Wales Champs race) Peris Horseshoe with the only Helsby runner out on the day Chris Baynham-Hughes. This race is a big one, over 17 miles and 8000ft climb so not for the faint hearted and a fantastic result for Chris in a quality field. Results are on the Welsh Fell Runners site alongside some photos released by Alistair Tye. Race report should follow from Chris which I’ll update on the blog. Sunday 15th was the Sutton Six, a Cheshire Grand Prix race and our last Helsby road counter of the season. This race is organised by West Cheshire and began as a six-miler in 1982, becoming a 10k in 1993. It starts on Belle Vue Lane with a 3.3k lap, followed by a longer lap which repeats the first 2k, heading out along lanes on a measured course (12/016) around Guilden Sutton to finish at the village hall. Well done to Derek Morris for the Helsby road counter win and to Carol Shaw picking up the full points. XCredit also to Ian Hilditch for doing the weekend double. Sunday was also the Lake Vyrnwy Half and surprisingly no Helsby runners there this year (which must be a first in a long while!) but I’ll keep the results in just for completeness, now that I found them. I think a number of runners had been scared off by the predicted rain/bad weather on this occasion – they really missed out! 1) Firstly, we had no rain – result. 2) Secondly, the course is a challenging but scenic one. 3) Thirdly, the marshals were fantastic – very positive and enthusiastic – especially the lady at mile 18. The Robbie Webster Memorial Race – Robbie Webster’s Wobbler. Firstly I’d like to say what an honour and a privilege it was to stage a race in memory of the great Robbie Webster. I found Robbie an inspirational and passionate runner. Sadly Robbie passed away in 2012, yet in that same year he was regularly seen in the Helsby vest running the fells; completing both Cader Idris and Moel y Gamlin in 2012 – and far from last too! On a personal note, seeing Joe Beswick back on his feet again cheering everybody on and getting to incorporate Joe’s path into the race route seemed very fitting. 93 runners toed the line to pit themselves against Frodsham hill’s many climbs and beautiful trails. Five proper climbs were incorporated in the route seeing a total of 346m of ascent in just over 8.25km. A simply incredible turn out for the race, let alone that it was a closed race! I clearly tempted fate by suggesting that people were going to find it very difficult to go wrong… only for a small group of runners to do just that (including two that had recce’d the course). Despite this hiccup everybody still appeared to enjoy it and we learnt our lesson for next time. A fantastic run by Dave Alexander from West Cheshire…. set the course record at 39:40 and the only sub 40 minutes on the night, staying strong to hold off Jeff McQueen (also West Cheshire) into second place and Graham McNeil from Wilmslow who was third. On the ladies side a win by Pensby runner Lisa Grantham followed by Ali Lewis for second and Sarah Roberts for third both also for Pensby. The course didn’t give in easily leading to one retirement and a number of bumps and scrapes visible at the end as the light began to fade. The weather helped to showcase Frodsham hill’s splendour with a number of runners commenting on the beautiful yellow/ orange/ red shafts of light dazzling through the trees – colour depending upon runner speed! It was great to see so many faces back at the Helsby RC clubhouse for the social afterwards. The Sandwiches, homemade quiches and cakes did an excellent disappearing act along with the odd beer or two. I’d like to take this opportunity to once again thank the Forest Hills Hotel and health club for allowing us to use their car park and facilities, Les Hewitt for taking over registration and doing the results for the interclub champs so quickly, all the marshals without whom the race wouldn’t have taken place; all those that helped bounce ideas and tweak the final course, the cake bakers and finally I’d like to thank all the runners for taking part, I hope you all enjoyed it! Nick Wishart from the Spartans took these at the top of the 2nd steps (or was it the third set J). Some people feeling the climb! Profits from this race have been donated to the Royal Liverpool Hospital on Robbie’s behalf. PS – The Wobbler will return next year, but probably a little earlier in the year so we can start it a little later without racing against the light. It will also be open to all next year. 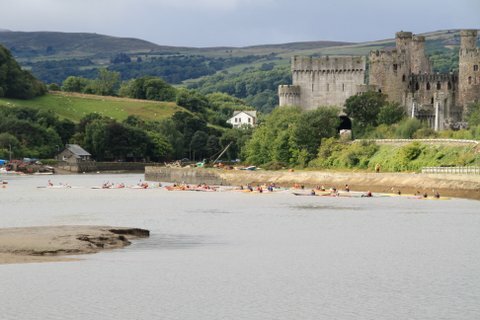 Sunday 8th was the Dyffrn Conwy Mountain Triathlon – a brilliant race organised by a very enthusiastic team of dedicated kayakers, runners & mountain bikers. http://www.map17events.org.uk/ The organiser, Ellie Salisbury who is part of Fabian and processes our Four Villages entries, encouraged me to take part despite me not having been in a kayak for 20 years. Ellie put me in touch with Chester & Conwy Canoe clubs and over the last month I have been encouraged all along the way by the most friendly club members who have taught me the basics over 6 sessions on the Dee (thanks to Jean & John et al), River Conwy (thanks to Penny & James et al) and Manley Mere (thanks to Dave Feakes for the loan of his 2.3m pyranha). 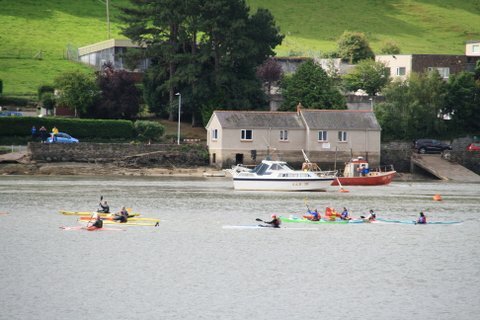 On Saturday tea time, Bill & I met up with Penny from Conwy Canoe club who had kindly arranged for us to pick up a 5.2m Kirton Tempest kayak. It didn’t fit in the camper van so 3 other competitors, who were also there picking up their kayaks, helped us attach it safely to the high roof of our camper van. We overnighted at the race base, Trefriw Rugby Club. Following a team brief at 9:30 there was a mad dash to the RSPB reserve at Conwy. 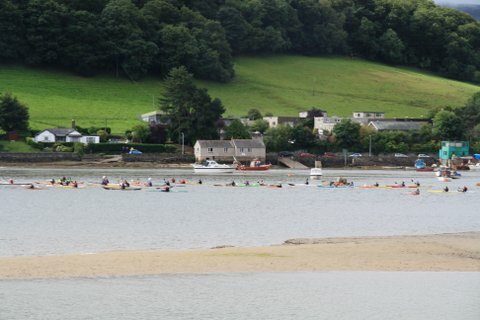 After launching the kayaks we lined up on the start line at the bridge embankment with the iconic Conwy Castle looking down on us. Weather was mixed with sunshine and showers with a southerly wind. The start was 1 hour before high tide. 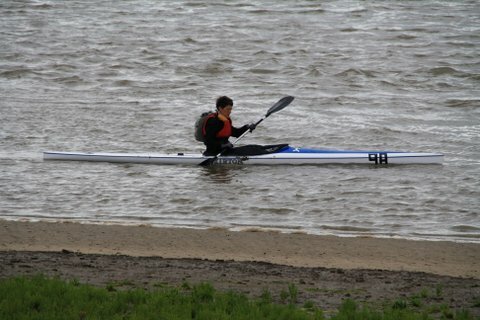 A 13K open water estuary paddle followed. I could not believe the different conditions met en-route; choppy wind blown waves, made worse by a passing motor boat, whirl pools, faster flowing currents, interspersed by tranquil patches. The notes said follow the scum for the best current! This was a good tactic but in that scum was a lot of debris including seaweed and floating logs, which caused a wobble when the paddle caught. 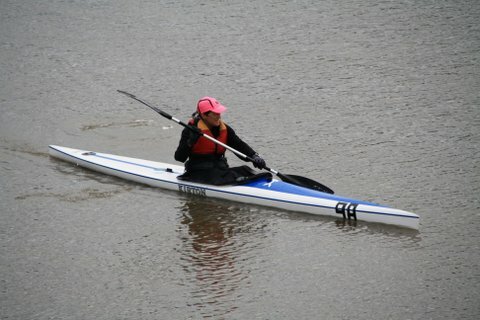 All this was a bit nervy for me who was paranoid about capsizing – I have not got the greatest affinity for water ! Under the Tal y Cafn bridge for a photo shot and onto the finish at Dolgarrog. 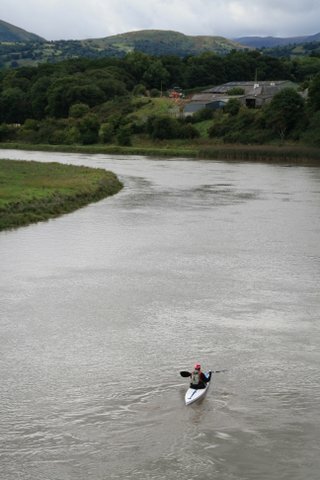 The river was quite narrow and it was the most amazing feeling paddling, alone by this time, but not quite at the rear. The silence was amazing, alongside the most gigantic reed beds (SSSI) wafting in the breeze. A muddy reception team dragged me up the slippery bank and took care of the kayak. A quick stretch, then off on a 13K fell run. There was an early steep climb up to the Llyn Cowlyd Reservoir following the hydro pipeline (yes it’s got to be steep). Lots of encouraging marshals along the way, and the provision of drinks & jelly babies at the dam before a further climb to 500m (in heavy rain). Despite the rain and drinks I could not get rid of the dry salty taste from the kayaking. Bog and slippery paths down through bracken and bramble in parts followed. Yes summer is over and the ground is now back to normal after the dry spell! Finally crossed the Crafnant road for the final steep drop down to the Rugby Club. A quick changeover, more jelly babies & a banana, and a thankful sit down on the bike. Then up the steep tarmac road to the Marin Trail Carpark for an 18K ride, dodging on and off the Marin Trail. A figure of 8 route around Lynn y Park. A mixture of forest tracks and narrow single track, current forestry operations making some of the wide tracks very muddy and hard work especially as by now it was pouring down. Managed to ride more of the Marin than I imagined, and have now got over my phobia of riding through deep puddles you can’t see the bottom of. An enforced rest to release a jammed chain, before a final series of slippery slate drops defeated me and I ran with the bike instead. A muddy track with fords and finally down to a waiting crowd at the muddy finish. A fabulous quick hot shower at the Rugby Club made me look more respectable; rugby showers are obviously designed for mud ! Into the bar, just in time for the presentation, a delicious veggie curry and cuppa + pint of shandy. All in all a brilliant experience in an amazing location, just 1 hour from here. A very well organised complex event with a incredible number of marshals and helpers on the day + it must have taken many hours to plan. 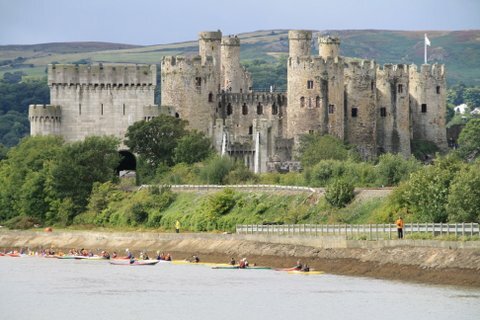 So a big thankyou to the Ellie and the organisers, marshalls & helpers at Map17 events + a very big thankyou to all those friendly paddlers at Chester & Conwy for all the encouragement and help along the way this last month. Only 4 solo ladies and 3 of those were V50+ !!! P.S. Hope to be back next year with a bit more training and experience ! This made Helsby men’s team 19th on the night and Helsby ladies A team 12th and B team 27th. Hopefully we can improve on that in the subsequent races! Wednesday night was our final Inter-club fell counter and the highly anticipated Robbie Webster Wobbler. With some brilliant planning and organisation from Chris Baynham-Hughes and his team of helpers (proper thanks will be in the full race report!) the night was definitely a success. We’ll add a separate blog report of the race but one thing we should make known is that after some fantastic support from club members in this series Helsby managed to win the much coveted and highly prized Inter-Club trophy. This definitely highlights the current strength in depth at Helsby and something I’m sure that would have made Robbie Webster very proud. Friday night was the final race in the Multi-terrain series at Deeside. Brilliant running from Colin Bishop saw him claim 1st in his age category over the four runs and 7th on the night. Looked like we were going to get very wet but the skies actually lightened a little and the race was in near perfect conditions. Thanks to Jane for support on the night. Saturday was also the ‘Across Wales Walk’ with a race report from Andy Robinson. 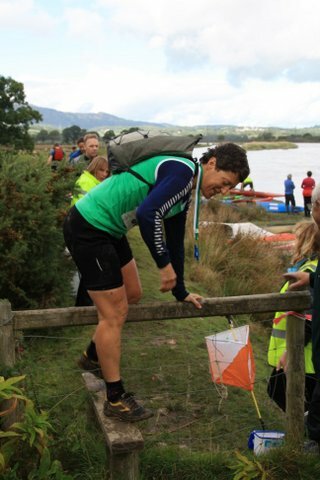 “ I ran the Across Wales Walk again on Saturday (my 7th consecutive year). 45 miles from Anchor Bridge near Clun in Shropshire to the seaside at Clarach Bay near Aberystwyth, taking in Plynlymon on the way. First in was John Parry in 8:27 & I was second in 8:35. I won’t be running fast on Wednesday night! The weather wasn’t too bad considering how awful the forecast was, & we got good views from Plynlymon. Head wind the whole way, but it was a great event. Results probably won’t be posted for weeks yet..” Well done to Andy on another fabulous long distance achievement. It was the Spire Healthcare English Half Marathon in Warrington yesterday, some good results once again for team Helsby on a hilly and windy course! Please find the results below and a link to the full results also. 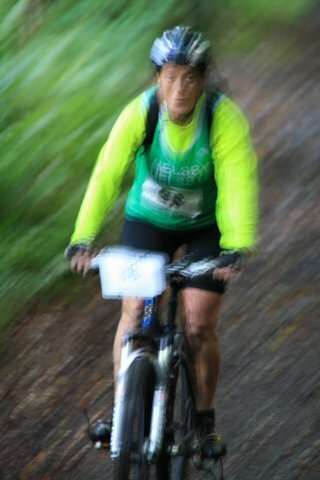 Sunday was also the Dyffrn Conwy Mountain Triathlon – a brilliant race organised by a very enthusiastic team of dedicated kayakers, runners & mountain bikers, which Jackie Keasley had entered. I’ve received a fantastic race report from Jackie so will add this to the blog as a separate article with photos so be sure you take a look at the blog! As you can see a busy week was had by all at Helsby so make sure you come back to the Helsby blog to read more about the Robbie Webster Wobbler and Jackie’s Kayaking Triathlon. Last Wednesday was the 4th Harrock Hill race of the season with three out for Helsby, Adair Broughton, Jayne Joy and Paul Foster. Good prizes too as they were big boxes of vegetables and fruit! Jayne Joy was 3rd lady overall. The race was also the venue for the Northwest Cross Country league meeting attended by Jayne Joy who sorted out the dates for the upcoming season and also managed to keep Helsby in a team with Warrington and Lymm as it was looking close to Helsby being split up due to their recent success of the last couple of years. (It will be looked at again next year). The cross country dates for the Northwest league have already been updated and placed on the latest running calendar available on the Helsby Blog as below. Saturday was the Delamere Park Run, already up to race number 26 and as ever a great Helsby turn-out. Colin Bishop on the podium with 3rd place overall in 17.59 and Janet Robertson first lady home for Helsby in 22.46 and also on the podium with 3rd lady overall. Well done to Betty for securing a new PB for the course. As always if there has been any other events you’ve been involved in and I’ve missed please let me know as I’ll update the blog each week with anything previously missed. As many of you know it’s the final Inter-club fell race on Wednesday night the Robbie Wobbler, so please come and run or support as we have a great chance of winning the series this year! Register from 6pm at Forest Hills, Frodsham, but remember there will be a prompt 6.45pm start. However, I realise many of you will be ‘sensibly’ resting for Wednesday but tomorrow night, Tuesday 3rd September is also Race 1 of the Wirral Multi-terrain series at Royden Park, Frankby with a 7.00pm start and a fee of £1 per runner. These are a great series of races all run over different terrain and historically been very popular with Helsby runners. They are also team events so the more we have out for Helsby the better.